she will visit her loved ones today. details of her embroidered dress. Candles light the path of the souls. The path of the souls to the feast. 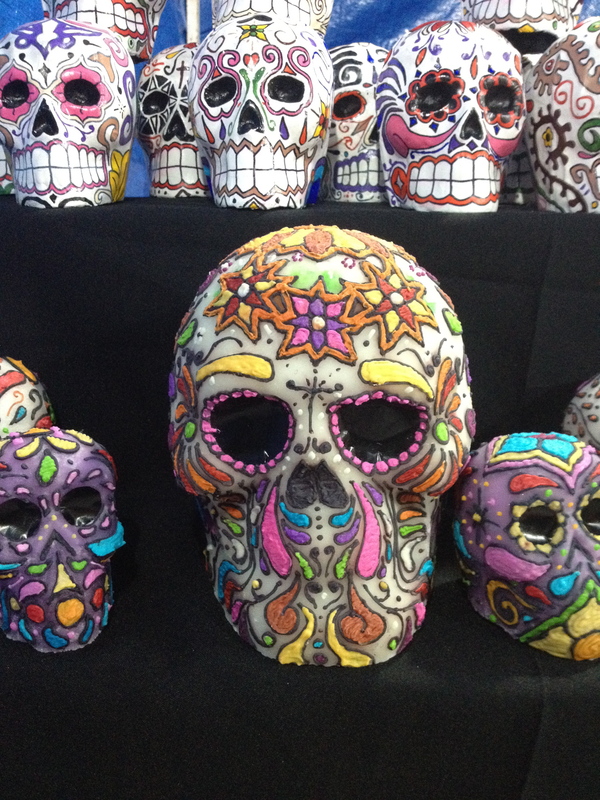 La Catrina finds her offerings. A Circle. A circle of bones. 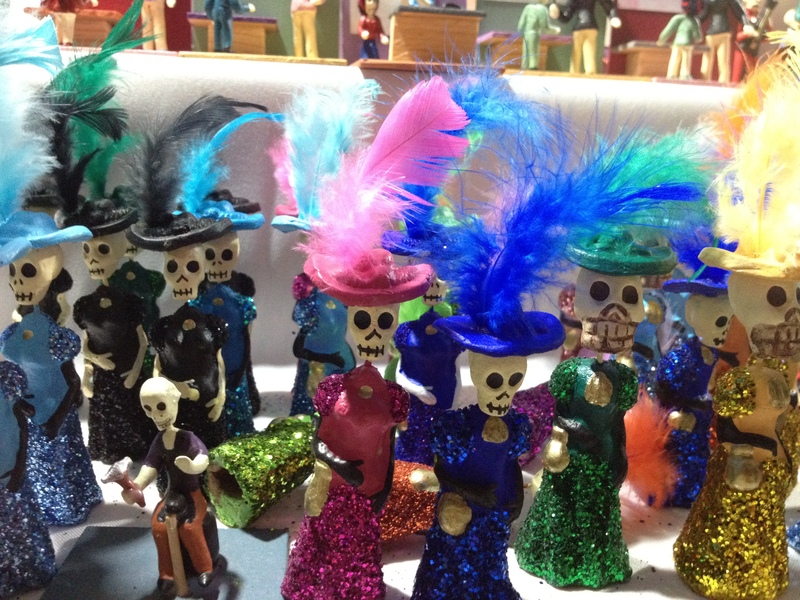 Friends and family join La Catrina. PS: Only one more full week of Peace Corps training before I become a Peace Corps volunteer. No puedo creerlo. My home for the next two years, I thought as I approached Huimilpan for the first time, “the place of the biggest cornfields.” My whole reason for joining the Peace Corps, to live and work in a community, was finally manifesting itself after a month of living in México. It was time for my site visit, time to gather the information I needed to survive physically and mentally for two years. Gathering, recording, processing. It felt a bit like collecting kindling with full arms. My mind was already heavy with new information. 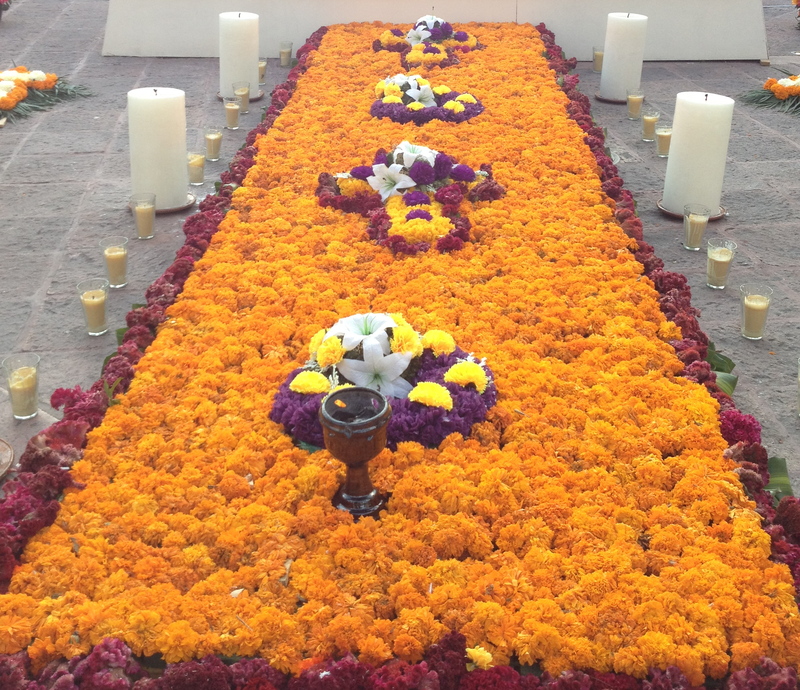 Taking a deep breath and fortified by the scent of the sea of flowers surrounding me, I stepped out of Señor Francisco’s car. A combination of nerves and leaving the controlled setting of my Spanish classroom, instantly transformed this “intermediate” Spanish speaker into an eight year old. Nice to meet you. Smile. Nod. Smile. Fumbling over my words, I desperately tried to link context clues with what my boss was saying. Please,..time..to..process…the..translation. There was no stopping. “This is so and so, and this is my cousin so and so.” Dozens of hands shaken, dozens of kisses given. Nice to meet you. Smile. Nod. And so it went for four days in Huimilpan. Freeing embarrassment from my list of possible emotions, no entiendo, otra vez por favor, became a motiff in every dialogue. Smile. Nod. Locals turned a much-appreciated blind eye to my broken Spanish, helping me to feel less like a fish out of water. People were kind and patient, taking the time to repeat their sentence or say the same things with simpler words. The smile and nod returned if all else failed. As the days passed, it seemed that the people of Huimilpan were happy just to learn the reason behind why there was this foreigner, the gringa, walking around town. Mexicans aren’t very shy in asking personal questions. Luckily, my family prepared me for this growing up. Uncles always put us on the hot seat during Sunday dinners to interrogate us about the latest boyfriend, or life step. With this experience under my belt, fielding the questions wasn’t too hard to navigate. Thanks, Uncle Joseph. Foreigner celebrity status was a bit harder. Sitting in the plaza after attending the outdoor mass to celebrate the Huimilpan’s patron’s saint, San Miguel, I felt hundreds of pairs of eyes of me. Peace Corps warned us about this. Since we Peace Corps volunteers are the odd ones around in our communities, people will be looking at our every action, all day, everyday. Gaga status. While in site we are “on” all the time. Gaga status does have its perks though. 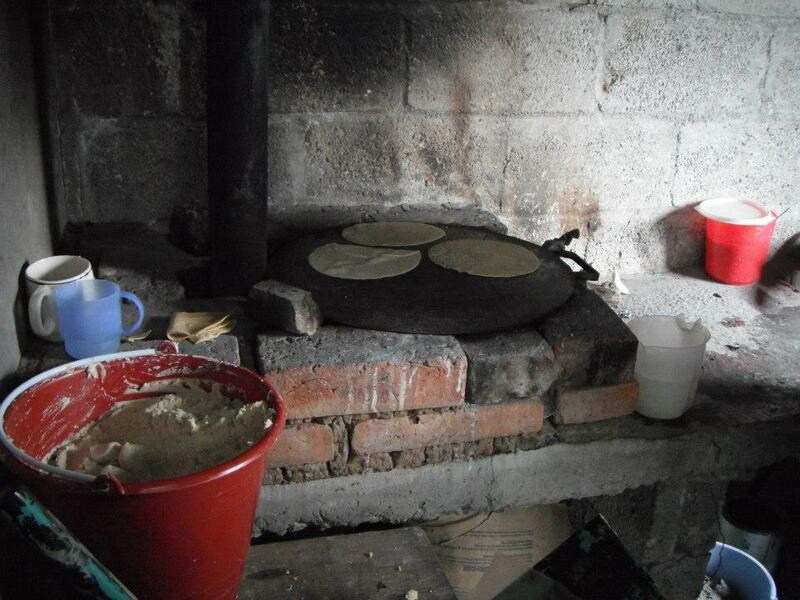 While visiting one of the communities, Piedra Lisas, and chit chatting with a woman about her different eco-technologies, I was invited to make some tortillas with her using one of her eco-technologies, her efficient wood stove. 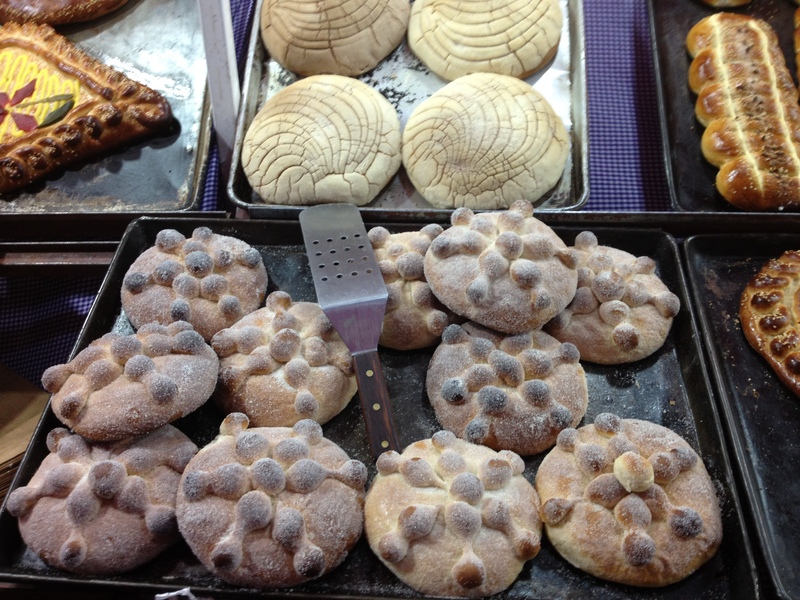 When conversations involve food, somehow I manage to understand that Spanish. We spent the next hour making and eating corn tortillas with salsa made from the chili peppers she grew in her garden. Hot tortilla in hand and a mouth of fire, I stepped outside for a second and checked out the surrounding view – my new home. It was then that Francesca’s poem popped into my head. Francesca wrote “Simplistic Beauty” for me when I graduated from Tulane to serve as a constant reminder of the person I am, and the person I hope to be. 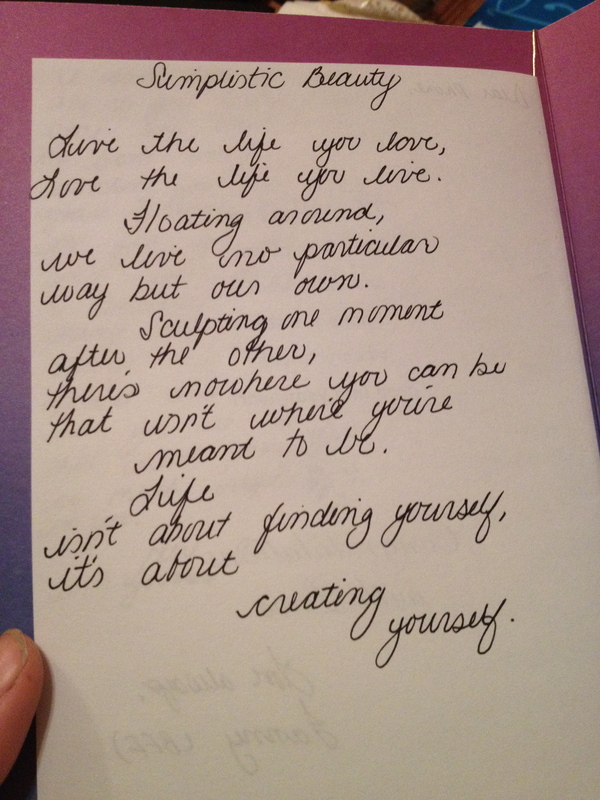 “There is nowhere you can be that isn’t where you’re meant to be…life isn’t about finding yourself, it is about creating yourself.” With this as my mantra, Huimilpan didn’t seem as intimidating anymore. 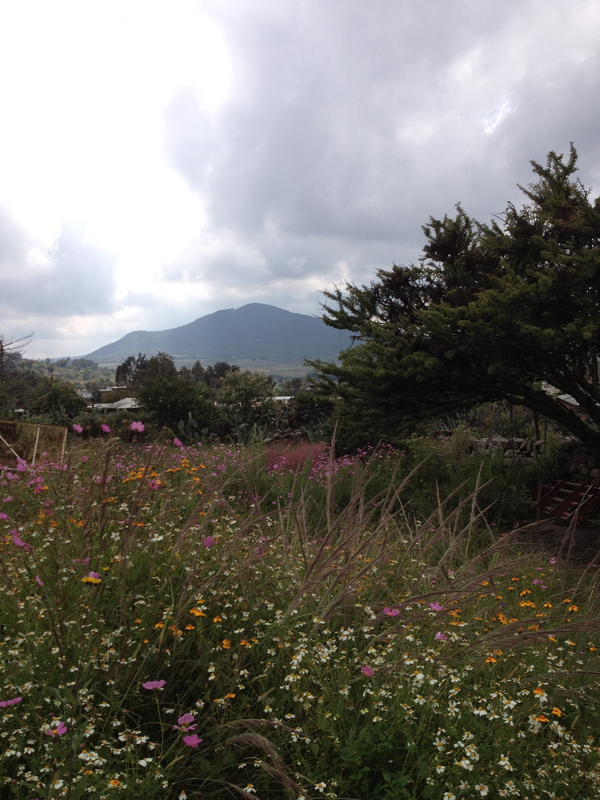 I went back to my host house in the city of Querétaro, took out my Spanish Grammar Book, and got to work. After all, I can improve a lot in the month before my service begins in Huimilpan. PS: After an extended period of thinking about every verb ending before speaking, all I wanted to do is chit chat with other volunteers in English upon my return and know certainly that they understand the sounds rolling off my tongue. PPS: With only a quick assessment of the community to inform this, I think I will be working to build water cisterns and developing people’s individual gardens! 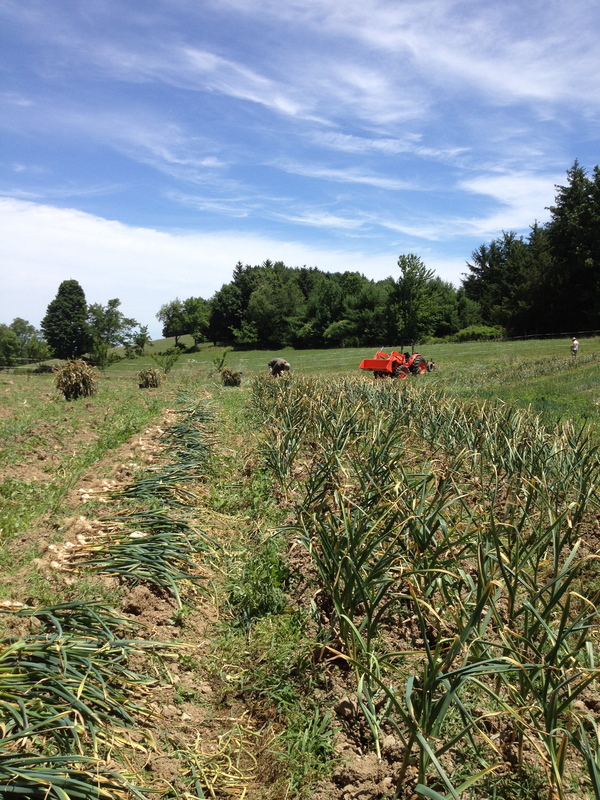 When we first arrived at the farm, we noted that the garlic wasn’t quite ready to emerge from the cool earth. No, as steadfast as it is pungent, the garlic was prepared to wait patiently for a few more days of intense heat, growing proportionally stronger with the heat index. So, we spent those days weeding and eating, all the while waiting for the garlic to summon us. As we were in the field, ripping weeds from the earth, the sun baked our backs. The heat the garlic needed, I grudgingly noted. A few days passed, and a few less pounds of water weight I carried. Growing delirious from the sun, I walked over to the planted garlic. Just as I was about to reconcile that I would not be able to harvest the garlic during my time at the farm, I was given the signal. Several of the lower leaves of the garlic were brown, but the top five or six leaves were still green. The garlic was ready to be relieved from the dark den it had known the entirety of its life. The garlic was ready to metamorphose from a mere plant to the beloved raw garlic cloves we all reach for while cooking. 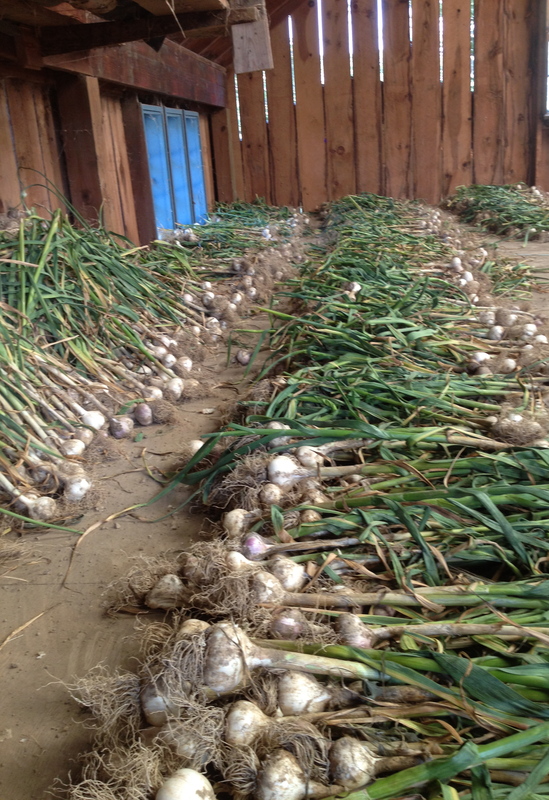 Francesca and I were so excited to harvest the garlic. This was the main reason we returned to Threshold Farm – to see a process come full circle. Cycles are inherent to the entire concept behind the farm, permaculture. Produce no waste, create feedback loops, and integrate the community. We loosened the dirt, and before long, the circle we began to draw in October, was complete. PS: The vampires will stay far away from me. Hehe. 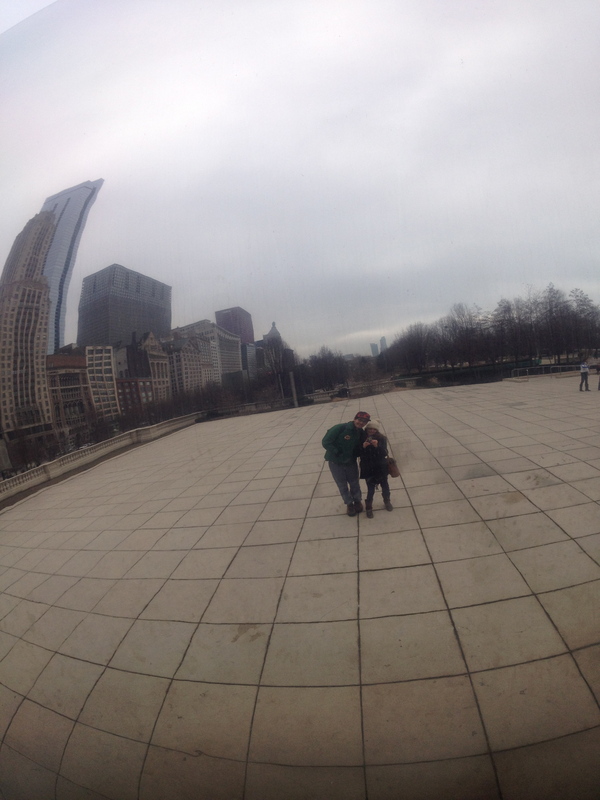 The other day was my first time in Chicago, and by far my biggest priority was to see the Bean, or the Cloud Gate. Typical tourist. I know, and I totally reveled in it. I first saw some of Anish Kapoor’s work at Gladstone Gallery in NYC in 2008. Since then, his work has continued to fascinate me, especially his ability to engage the viewer in his work and question their perspectives. Unsurprisingly, this artist has captured my sister’s attention too, and I invited her to share some insight on the sculptor’s work. 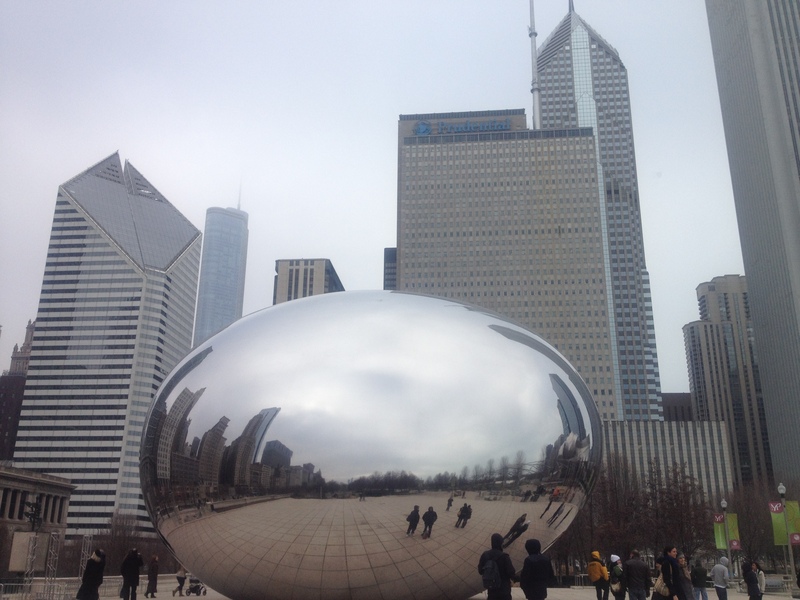 The Cloud Gate in Chicago’s Millennium Park is a seamless construction, executed with precision and talent. A total of 168 stainless steel plates comprise the exterior, yet the Gate appears as a whole bean-shaped drop of “mercury” amidst the city backdrop. The form and stainless steel material of the Bean then allows the sculpture to form a dialogue with both its audience and the surrounding environment. The sculpture entices the audience to play with their reflections and distorted shapes, and to walk around and even under the sculpture. The viewer quickly learns that different points of contact with the sculpture yield different reflections, different perspectives, and a totally different experience with the art. This experience, with the backdrop of Chicago’s downtown reflecting in the Bean throughout, unites the viewer, the environment, and the sculpture as one entity. 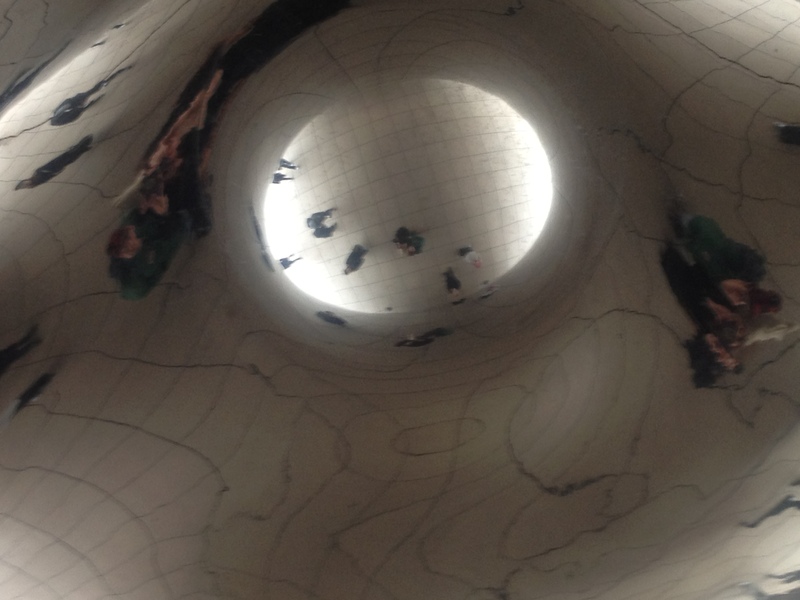 Anish Kapoor successfully created a world within a bean – a windy world.